What Is a West German? TURMOIL IN CENTRAL AMERICA Here's Why! Ladies and gentlemen, greetings! Back in World War II Winston Churchill addressed the United States Congress. And he said to our Congress; "There is a purpose being worked out here below." Now certainly that implied a higher power above doing the working out. But if there is a purpose being worked out here below, not very many people know anything about it; not very many people seem to be concerned. If there is a purpose, that purpose has something to do with why you were born; why I was born; how did the human race happen to be on earth; how did we come to be here? We didn't just happen from some happenstance. The first life had to come from life. It didn't come from some unknown process like electrochemical action, or some unknown process, by resident forces, no mind, no planning, no design. Oh no, my friends, there was planning. There was mind back of it. There was a supreme power and there was purpose. And there is a purpose being worked out here below. Not very many understand it, but the one doing that working out above reveals that purpose to us. Now it's revealed in the world's best seller, the book that sells more copies than any other book, and has been selling that way for the past hundred years and more. And yet it's the book that nobody seems to understand. It's the book that, even if they understand nobody seems to believe, because when our Maker speaks, people don't seem to want to believe what God Almighty says. But He tells us why we're here. He tells us what that purpose is. He tells us what is being worked out. Now one-third of the Bible is devoted to prophecy; one-third of the Bible is telling us what is going to happen. Some of those prophecies have already been fulfilled right on the dot in exactly, precisely as they were given. However, most of the prophecies, ninety percent or more, are yet to be fulfilled, and in our time. You and I are living in the time when biblical prophecy is beginning to be fulfilled as never before. 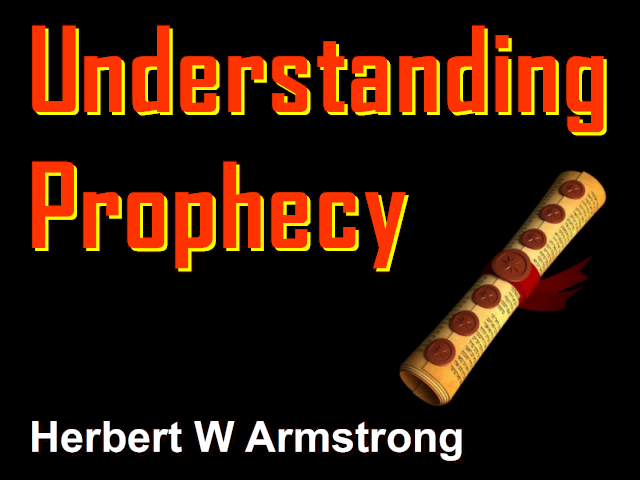 Most of the prophecies are from now on the next few years. I can't tell you whether it's a couple, or three years. I can't tell you whether it's five or ten years. I know it's in this generation. And it's going to affect you and your life! And so you'd better listen, because you're betting your life on it. Your life depends on what is going to happen. Now the apostle John wrote this book about 90 AD, he put it in writing, he wrote it. Now the book, as we see in chapters four and five, was in the form of a long scroll rolled up. Not a book like we have today. We're using books in a different style, a different form, today. When I was over in China recently, in the library, they were showing me some of their ancient manuscripts. And they were all long scrolls rolled up. They had them, not sealed, but they had them bound with rubber bands that they just stripped off. However, this scroll was sealed with seven seals. And you can only open one seal at a time. And that'll let you read a little of it and there had to be another. But there were seven seals and it was a closed, sealed book, and the thing is, you read in chapter five; "No man on earth was able to open that book to our understanding." (Revelation 5:3 paraphrased), so that we can understand it. It said that only One qualified, and that was called the One who was Jesus Christ, called the Lamb of God. No one else was able to understand it. No man is able to open it to our understanding. Now many men have tried to do it. They have not made it plain because they have not been able to understand it themselves. They have been misguided. No, only One was able to open the book to our understanding. Now it was sealed. But now it is the revelation, the revealing, of Jesus Christ. Jesus Christ then began to open these seals. He, and He alone, could open it to our understanding. I've covered this recently a few times, but I want to go over it again real quickly now. He opened the first seal. And we find the first six seals revealed in chapter six of the book of Revelation. Now real quickly, I'm just going to rehearse over a little of it, because I've covered this in previous programs — well a couple or three weeks ago. Now he saw in the right hand of the Lamb, who was Christ in this case, open one of the seals; and he saw a white horse. Now a lot of people have disputed who this white horse was. Some thought it was the Second Coming of Christ. And they've had all kinds of ideas. None of them is right. But I want to pass right over that for the time being, because Christ is the one that has to tell us what it means. He's the Revealer. So then in verse four we find that he saw, next, another horse. And that was a horse that is red. And then after that he saw another horse, a black horse. And there was a rider on each of these horses. And then, finally, the fourth horseman, a pale horse, and a man on that horse. Who were these four horses, or the four horsemen? Now years ago there was a saying going out that the four backfield players of the Notre Dame Football team were the four horsemen who were quite famous. I don't know how many of you might remember that? That's some few years ago. I remember it very, very well, myself. But they were not the four horsemen meant here, by any matter of means. Now Jesus is the One that had to open it to our understanding. And He doesn't do it here. Here we find everything is in symbol, and it's symbolic, and you can't understand it if someone doesn't explain the symbols. You can't decipher the symbols. It takes Jesus Christ to do it. Where, then, does Jesus Christ do it? He does it in you might say; well, at one time, but it's recorded in three places in your Bible and that is in Matthew 24, in Mark 13, and in Luke 21. In other words Matthew, Mark, and Luke all recorded the same speech that Jesus made. Now you have to put them all together to get the whole truth. But primarily I'm just going to use the book of Matthew at this time, because it gives us all we need to know. The others only corroborate it and fill in more details. Now in other places we find that Jesus had been talking to His disciples and had told them that He was going away, but He was coming back. And they knew He was coming back to end this world and bring in a new world. Now the place where this saying; "...the end of the world..." (Matthew 24:3) got started was in this very verse in Matthew 24, where they asked Him that. "...the end of the world..." (Matthew 24:3). They asked Him that question. He didn't mean the end of the earth. All He meant was the end of man's government and man-built society on the earth. And a new world is coming. I've been calling it; 'The World Tomorrow.' That has been the title of this program for a long, long time, for a great many years. Saying that Jesus is the Christ, He didn't say; "Many will come in My name saying 'THEY' are Christ." Oh no, He said; many will come in My name, saying, that I Jesus, am the Christ,' but they will be deceiving the many." Now how can they do that? Well perhaps I'll have time to explain that, I hope. You'll read that in Matthew and also in Mark the seventh chapter. Again, you can worship Christ in vain and He said many were doing that. The black horse represented famines. The pale horse represented a disease epidemic, pestilences coming as a result of famine. And that is — we've had foretastes of that, but the real terrible famine, and the real epidemic, is yet to come. And it's going to kill many, many people. Many lives are going to be taken. The Word of God is the Bible. They believed the Bible; not very many do. But they were martyred. Now this is just as though they, as if they were still living, and their voices were crying out. It's just like one place Jesus said; "...the blood of righteous Abel cries out from the ground." (Matthew 23:35 paraphrased). And it was the blood that was crying out in that case. And it seems like they were getting impatient. Of course the Bible says that; "...the dead don't know anything..." (Ecclesiastes 9:5 paraphrased). Maybe you didn't know that? Someday we'll get around to showing you all those things in the Bible, because people have never understood the Bible anyway. Now the first time was prior to 70 AD and after that. They were delivered up to be afflicted and they were the ones that were crying out; "When will you deliver us, or avenge our blood?" (Revelation 6:10 paraphrased). So that then is the fifth seal. It continues on down to verse twenty-one. God is going to intervene before that happens. That is the time called by many; 'The Great Tribulation'. That is going to come, really that's the time of Satan's wrath, not of God's wrath. But very few people seem to understand it. Now you see you've got the same thing in Matthew 24, verse 29, and also in Joel 2:31. First is the Great Tribulation, then God comes to intervene and stop it. But there are terrible signs that God has in heaven. Now man can't do that, and men are going to scream. But the Day of the Lord will not come until after the Great Tribulation. And the signs in the sun and moon will come after the Great Tribulation; but the Day of the Lord comes after that. So then that finally comes down to the time of the Second Coming of Christ. Now Matthew 24, let's go on from verse 30 now. That is the resurrection of the dead in Christ. They're going to be raised out of their graves immortal, their faces shining like the very sun, they will be god persons, god beings, no longer human. Those are the dead in Christ, not out of Christ. And we're having the same kind of violence they had in the days of Noah. They didn't know until the Flood came and took them. Just like a rat gets snapped in a trap before he knows what snapped him. Well God is warning us and we ought to know. We ought to be forewarned. I said in a recent program that if a hurricane is coming toward the Florida coast, if they don't have a warning, they can't be prepared for it. It's very necessary that they have a warning. Well it's necessary that we have a warning for these things. And God is giving it to you, and my voice is giving it to you, and you are being warned, and you had better be watching! Now of all of the books in the Bible, the most mysterious is the book of Revelation. It has never been understood. But Jesus Christ opens the seals. He explains what it is. There's a lot more detail than I've been able to give you. I have a booklet I'd like to have you receive. It's called, 'The Book of Revelation Unveiled at Last.' - 'The Book of Revelation Unveiled at Last.' I'd like to send it to you and there's no charge, just gratis. And we're not out to get, we're out to give. We have nothing to sell. We're not going to ask you for money, unless you already start sending us money of your own accord and you indicate that you want to be a co-worker with us. Otherwise we're not going to ask you for money. We just want to give it to you. We're in the work of giving. The world is in the, sort of, life of getting and taking. Now in the midst of this is a chart of the whole book of Revelation. It'll give you an understanding of the book of Revelation such as you never had before. This will open it to your understanding. This booklet, the key to the book — well it is: 'The Book of Revelation Unveiled at Last.' It incorporates the booklet that was entitled: 'The key to the Book of Revelation' That was just a very short one, but that's incorporated in this book. And it explains it to you in plain language just as Jesus does. He's the one who reveals it. He's the one who opens it up to our understanding. And we have so many other books we'd like to send you. Now we might notify you of some of the others that we're willing to give to you. But we're not out to get. So until next time this is Herbert W Armstrong, goodbye friends.